Micho adresses journalists at Kabira Country Club in Kampala this morning. Coutesy photo. 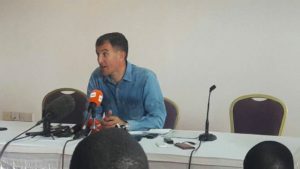 Now former Uganda Cranes coach Milutin Sredojevic “Micho” has this morning officially terminated his contract with the Federation of Uganda Football Association (FUFA) confirming all rumours that he will no longer be Uganda Cranes coach. There were rumours that the main concern was his salary and allowances amounting to UGX230 million that the federation had failed to pay. “I had no reason to resign but I have a million and one reason to terminate my contract. I have my values which needed to be respected. I had never even missed any training session with the Uganda Cranes ” Micho said. He was addressing journalists at Kabira Country Club in Kampala. He said he will be available to assist any coach that will replace him. Micho (in blue shirt) interacts with journalists after the press conference. Courtesy photo. Micho’s departure comes less than 30 days to the crucial Uganda Cranes 2018 World Cup qualifier against Egypt. 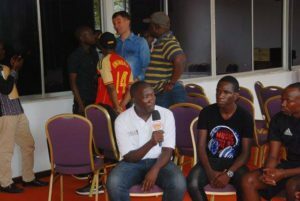 On Wednesday FUFA president Moses Magogo had promised, while at the Uganda Premier League awards, that the Uganda Cranes would have a coach by the time they play Egypt on August 31 in a World Cup Qualifier.